Sharks, and Puffers, and Whales! Oh My! I've talked about the Smithsonian Institution animal books, published by Soundprints, before (over at 5 Minutes for Books.) After the Book Expo in NYC earlier this May, I was given an opportunity to peruse a few more of their titles and you can bet I jumped on them! Non-fiction books on sea life have been Our Thing this past year (we're slowly moving on into dinosaurs, if you can believe it!) and the Smithsonian Institution collection of books is like none other! We started with Great White Shark: Ruler of the Sea and it was an instant hit. 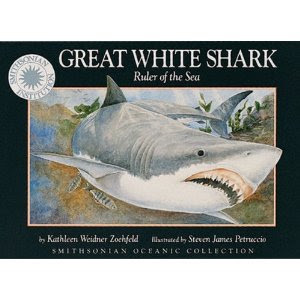 In this book we meet a two day old great white shark who smells some blood and takes her to a feeding frenzy. (Ok, here's where I admit I wasn't sure how Bookworm1 was going to take to the blood and guts but it didn't seem to phase him.) Through this book we kind of follow along her explorations in an almost documentary type of way. We discover the animals most likely to cause the great white shark injury and we see how she grows and wises up in order to feast upon her favorite prey. I like how at the back of the book they include facts about the animal you are reading about and the facts tie into the fictional story that they are sharing to inform young readers about the animal world around them. We have long been a fan of whales and one of our favorites is the sperm whale. Why, you ask? In a word: Monstro. 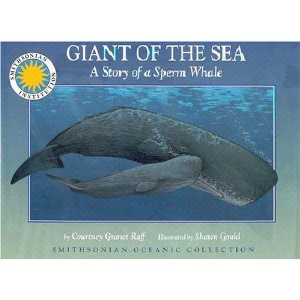 Therefore we enjoyed reading Giant of the Sea: The Story of a Sperm Whale where we meet a pod of whales swimming together off the coast of Hawaii. (See? Already this conjures up beautiful and peaceful pictures, does it not?) We find a mama whale caring for her baby, teaching it how to breathe and watching her dive and hunt for food. We learn about how she makes sounds which produce echoes which help her to navigate in the waters and yes, there is a picture of the whale eating a giant squid. There are THREE WHOLE PAGES of the whale, uh, "interacting" with the squid. (Whale 1, Squid 0) We love this book. Again, at the very back there are a couple of paragraphs which include additional facts and information about the sperm whale. 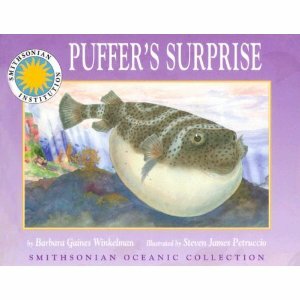 Of course, not all of the Smithsonian Institute books focus on sea life, but since that's what we focus on - that's what we read. We read a lot of sea life-related books. Bookworm1 sat beside me, begging me to read this to him. I kept brushing him off, saying he was perfectly welcome to look at the pictures but that it had jokes that only mommy or daddy could understand. He begged and cajoled until I finally found a kid-worthy one and read it to him. He didn't get it. So, if your kid is sea life crazy, I recommend you find a way to read Sherman on your own time. It's a much more pleasurable experience that way! 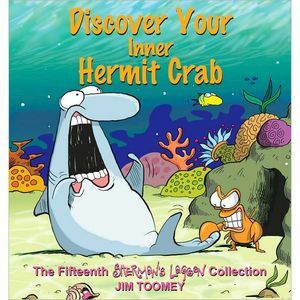 Thanks, Andrews McMeel Publishing, for allowing us the opportunity to giggle with hermit crabs and sea turtles and to Soundprints for allowing us to get our facts straight!